Additionally, more Americans have been leaving mainline Protestantism than joining the tradition. Nearly one-in-five Americans (19%) were raised in the mainline tradition, but more than half of them (10.4% of all U.S. adults) have left the faith. Meanwhile, 6.1% of Americans have become mainline Protestants after being raised in another tradition. 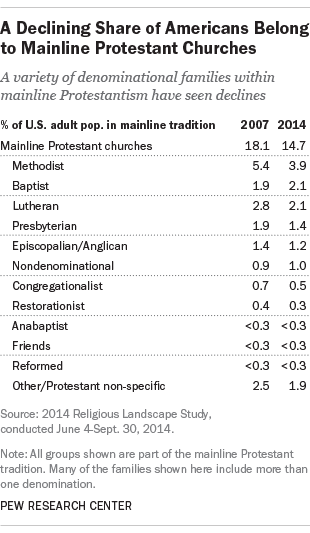 As a result, for every convert to mainline Protestantism, about 1.7 people have left the mainline tradition behind. Mainline Protestants have one of the lowest retention rates of any major religious tradition, with only 45% of those raised in the faith continuing to identify with it as adults. Young adults are particularly unlikely to stay with mainline churches – just 37% of Millennials who were raised in the mainline tradition still identify with mainline Protestantism. The declines within mainline Protestantism have been seen across a variety of denominational families (including Methodists, Lutherans and Presbyterians) as well as within specific denominations. For example, the share of those who self-identify as part of the United Methodist Church (the largest single mainline denomination) has fallen from 5.1% of U.S. adults in 2007 to 3.6% in 2014. As the U.S. grows more racially and ethnically diverse, mainline Protestants remain one of the most heavily white Christian traditions. The share of mainline Protestants who are non-Hispanic white has declined in recent years (from 91% in 2007 to 86% in 2014), but it is currently higher than the comparable shares for Catholics (59%) and evangelical Protestants (76%) as well as U.S. adults overall (66%). Note: A new interactive tool allows users to explore more detailed data for specific families and denominations within mainline Protestantism and other traditions. Chapter 1 of the full report on America’s Changing Religious Landscape has details about how respondents were categorized into different Protestants traditions, including mainline Protestantism.